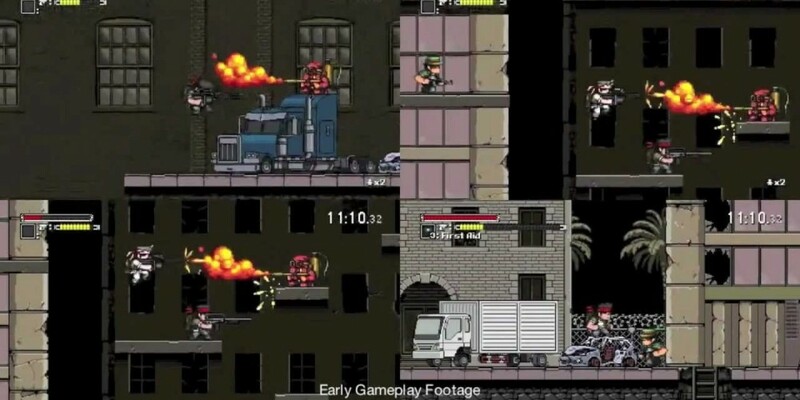 The eagerly awaited early access version of Mercenary Kings is now available for purchase. Mercenary Kings is currently in development stages by Tribute Games, the people responsible for bringing us to delightful Wizorb and the creative genius responsible for Scott Pilgrim vs. the World. As of now, you can opt in to the early access of Mercenary Kings by either downloading the game through Steam or through the developer website. Mercenary Kings features a very enticing art design that harkens back to side-scrolling classics such as Metal Slug. In the game, you serve as a part of the 'Mercenary Kings' as you try and save the earth from the fearsome forces of CLAW. Along the way, you will be able to customize and craft a wide variety of guns and blades, and also upgrade your body armor. The early access of the game features 60 missions, with an eventual 100+ missions planned. There is an online co-op component, but the final product is yet to be completed, and there may be some bugs to be found and reported. Eventually, the game will be launched on Steam for PC, and a PS4 version is in the works as well. Early adopters who purchase the game will also receive the full version when it comes out, which will be sometime around Fall. The game supports co-op play with up to four players. Page created in 0.3801 seconds.